Al-Adab al-Mufrad (The Manners of the Individual) by Imam al-Bukhaaree provides a vivid insight into the moral conduct of the early Muslims in a society led by the perfect character of the Prophet Muhammad, sallallaahu 'alayhi wa sallam. The Prophet's Companions represent ... Más informaciones excellent examples of men of vigorous moral stature whose conduct inspired and attracted the masses to the fold of Islam. We believe in Allah the Exalted, by His beautiful names and lofty attributes, which are affirmed in the Quran and the authentic Sunnah in a way which are befitting to His majesty; without Tahreef (distortion) or ta’teel (negating) or takyeef (saying how) and tamtheel ... Más informaciones (likeness to creation). Rather we say: All of his attributes are true and all of His names are beautiful. We affirm for Allah, what He has affirmed for Himself, what His prophet (Sallallahu Alayhi Wasallam), has affirmed for Him, and what the companions of the prophet,(Radiallahu anhum), have affirmed for Him; in what which is befitting to His majesty. His attributes do not resemble the attributes of the creation, and His names do not resemble the names of His creation. He has beautiful names, and they have great meanings. 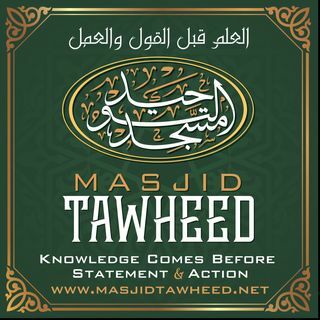 Taught at Masjid Tawheed on Tuesdays after between Maghrib and Ishaa Salah by Abu Muhammad al-Maghribi. This series is a beneficial explanation of Muhammad ibn Abdal Wahhaab's famous Kitab at-Tawheed. The book, as the title suggets, deals with the subject of worshipping Allah alone without associating partners with Him (Islamic Monothesim). The author highlights many matters that have become common among Muslims even though they are ... Más informaciones clearly acts of shirk or associating partners with Allah in worship. Not only is this book distinguished due to the importance of the subject matter but also due to the methodology adopted by the author for which he is well known. The majority of the book consists of verses of the Qur'an, ahadith of the Prophet (sallallaahu 'alayhi wa sallam), and sayings of the early Muslims. Lectures delivered in preparation for Hajj (year 1439/2018), describing how to perform this great pilgrimage in accordance to the authentic Sunnah of Prophet Muhammad, sallallaahu 'alayhi wa sallam. Classes include readings from the work and fataawa of Shaykh Muhammad ibn Saalih al-Uthaymeen related to Hajj. Delivered by Ustaadh Abu ... Más informaciones Muhammad al-Maghribi. In this short yet substantial tract of ibn al-Qayyim, he pens a message of heartfelt advice and appreciation to a friend of his by the name of 'Alā' Al-Dīn; invoking Allāh's Kindness, Guidance and Blessing upon him.Within this translation of 'Risalatu ibn al-Qayyim ila' Ahadi Ikhwāwanihi', the author explain ... Más informaciones the finer points of having a need in seeking Allāh's Guidance in all of our affairs and the means to persist upon the Straight Path. The risalah includes six weighty elements by which a Muslim can achieve happiness and pleasure; and through which righteousness can be perfected.The knowledge-based content of the book reflects ibn al-Qayyim's attention to detail, while explaining it in an easy to understand manners, it's modelled as sincere advice to his friend that will of course, be of wider benefit to all who read it IN SHA ALLAH. He commented that, "if you come to know what I have explained (in this message), you will then know that the ultimate pleasure, perfect delight and rejoice, grace and good life are found only in knowing Allāh, worshipping Him alone, feeling comfort and affability with Him, longing to meet Him, and devoting the heart and endeavors for Him. Masjid At-Tawheed, 5848 Memorial Drive, Stone Mountain, Ga 30083. This book is a collection of 99 Hadeeths which contain the concise speech of the Prophet sallallahu alaihi wa salam, compiled by 'Allaamah 'Abdur-Rahman as-Sa'di. The ability to use little words and yet carry abundant meanings is from the special qualities of the the Prophet sallallahu alaihi wa salam, who said: "I ... Más informaciones have been given the Jawami'ul-Kalim (concise speech)..." [Reported by al-Bukharee]. This collection highlights a portion of them, which the Shaykh compiled in order to explain in his book 'Bahjatul-Quloobil Abraar..'. In this publication, we have presented the original text in Arabic with full tashkeel (diactrical marks) alongside its translation in the English language. We have paid particular attention to the presentation of the book and printed the book on cream color pages in order to aid group studies and memorization. About the author: He is the noble Shaykh al-'Allaamah 'Abdur-Rahmaan bin Naasir as-Sa'di, one of the major scholars of Saudi Arabia in our present times. He excelled in the various sciences of Islam and authored many beneficial works which have been highly praised by the Scholars after him.). About Shaykh Abu Abdu-r-Rahman Nasir As-Sa'di Abd ar-Rahman ibn Nasir as-Sa'di at-Tamimi (1889 – 1956 C.E.) was a prominent Islamic scholar, jurist, exegete, and Arabic grammarian with a great interest in poetry who contributed many works on a variety of subjects. Initially, he adhered to the Hanbali school of Islamic law (madhab), as did his early teachers. He went on to study the works of Ibn Taymiyyah (d.1328) and Ibn al-Qayyim (d.1350) extensively, and, as he progressed in his studies, he no longer restricted himself to the Hanbali School, but rather followed the course he believed to be proven by the strongest evidences. He was also an expert in tafsir (Quranic exegesis or commentary), having read many books of tafsir and studied it under his teachers; he later authored a tafsir himself. From his most famous students is 'Allaamah Muhammad bin Saalih al-Uthaymeen. The Shaykh died 1376 A.H. (1957 C.E. Jumu'ah (Friday) Khutbah delivered at Masjid Tawheed, Stone Mountain, GA USA. “Beneficial Answers to Questions on Innovated Methodologies” consists of a collection of questions on issues of methodology compiled by Jamaal bin Furayhaan Al-Haarithee and answered by Shaikh Saalih Al-Fawzaan. The Definition of the Salafi Manhaj, Obedience to the Rulers, Warning against Innovators, Exposition of Deviant Groups, Refutation of some Innovated Practices, the Ruling on Groups and Parties, and Advice to Students. Altogether, this combination of a scholar’s guidance and wisdom with a student of knowledge’s research and investigation makes for an incredible and invaluable resource for Muslims everywhere to benefit from. Shaikh Saalih Al-Fawzaan, may Allaah preserve him, needs no introduction, as he is one of the major and senior scholars of our era, who is well known for his firmness upon following the Creed and Methodology of the Salaf. He is currently a member of the Committee of Senior Scholars. The Shama’il of Imām al-Tirmidhī is one of the most extensive and celebrated works on the description and attributes of ... Más informaciones the Messenger of Allah (sallallaahu 'alayhi wa sallam). The 415 narrations were carefully selected by the great muhaddith to craft a vivid depiction of the Prophet (sallallaahu 'alayhi wa sallam). Through this, a portrait of his blessed physical appearance, habits, worship, daily routine, spirituality and much more is painted by those most beloved to him: his noble companions and family members. To aid the reader in extracting the maximum beauty and wisdom from the narrations, we have carefully selected explanatory gems from over forty classical and contemporary works. Some of the scholars from whom we have taken include: Abdul Razzaq al-Badr, Ibn Hajar al-Asqalanī, Alī al-Qārī, Al-Bajūrī, Ibn Hajar al-Haytamī, Abū Bakr ibn al-‘Arabī , Al-Nawawī, Ibn al-Uthaymīn, Qadī ‘Iyyād, Ibn Taymiyyah, Ibn al-Qayyim, Al-Shawkānī, Muhammad Amīn al-Shanqītī, Ibn Abdul Barr, Ibn Rajab, Al-Qastalanī, Ibn Kathīr, Abdul Rahman al-Mubarakfūrī, Abū Hafs al-Sūhrawardī, Ibn al-Jawzī, Abdul Muhsin al-Abbad, Al-Suyūtī, Hafith al-Iraqī, Al-San’anī, Ibn Battal, Nasiruddīn al-Albānī and many more. Abdul Razzaq al-Badr said, "This blessed book is from the best and most beneficial books written about the character and depiction of the Prophet (sallallaahu 'alayhi wa sallam) and its author made it such an excellent work through his structuring of it and the hadiths he included therein. This is the reason why many scholars praise the book and consider it from the best books authored about this topic." Before you is a translation of the classical treatise: “Kitaab-ul Ilm” (The Book of Knowledge) of Imaam Abu Khaithama Zuhayr bin Harb An-Nasaa ee (Died 234H). This is the first book in the Classical Knowledge Series a collection of selected scholarly works from ... Más informaciones the past that deal with the subject of religious knowledge. respect to knowledge how they sought it, how they learned it and how they taught it to others. Therefore, this treatise is of the utmost importance as it provides the reader with an account of the Salaf those whom we are obligated to follow and take their example. About the Author: Imaam Abu Khaithama was one of the great scholars of Hadeeth of the past who narrated from many scholars, the likes of Sufyaan bin ‘Uyainah and Abdur-Rahmaan bin Mahdee. Those who narrated from him include Al-Bukhaaree and Muslim, the latter of whom reported so many hadeeth on his authority that they number past a thousand. English Translation of Qaidah Fi'l Sabr. The many instances of Ibn Taymiyyah's exemplary patience have amazed all those who have come to know of the trials he endured in upholding the traditions of the salaf. This book is a translation of Qa'idah fī 'l-Sabr which is included in Jami' al-Masa'il, a collection ... Más informaciones of Ibn Taymiyyah's shorter works compiled by our respected Shaykh, the Muhaqqiq Muhammad 'Uzair Shams. Although the treatise is short, it nonetheless contains much benefit and lessons and illustrates Ibn Taymiyyah's psychological disposition which strengthened him during his trials and tribulations, and furthermore allowed him to find peace and contentment in situations where most would only fall into despair and depression. Perhaps it will direct us similarly when we face inevitable times of hardship and difficulty.